Roulette house edge is considered to be 5.26%. 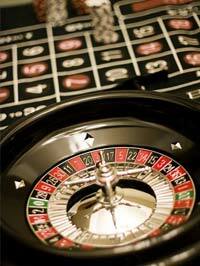 As in all casino games, the casino profit is calculated in. 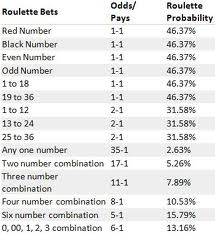 When we are talking about American Roulette, with numbers 1-36 plus zero and double zero, your actual odds are 1-37, if you are betting on one number, and it is perfectly logical, since there are 38 ball fields on the wheel - 1-36 + 0 + 00. But, your winning odds are 1:35, and that means that you will get 35$ on 1$ bet in case you have chosen the winning number. Maybe it sounds little complicated, but it isn't, really, if you consider the fact that 0 and 00 aren't calculated in when you are betting on, for example the first 12 numbers. It is basically the simple mathematics. Nevertheless, as a serious gambler you already knew the facts. There is no way for casino to end up loosing. Moreover, the only way to be sure you will win the money is to open the casino. So, should you play roulette anyway? Well, I don't see why not. The winning odds are high in roulette game, and it is an interesting game. Moreover, it's fancy and somehow different, doesn't matter if we are talking about live or online casinos. Go ahead and enjoy!